Alternate slices of squash and tomato. Flipping between channels last night, I paused long enough on a PBS special about cancer research to hear an expert say something to the effect that obesity has finally passed smoking to be the #1 preventable cause of cancer!!! I think this was rattling around somewhere in my subconscious, but I’ve never heard overweight put up there with tobacco as a risky choice. I know fat cells produce estrogen, but if you look online, you’ll see all kinds of documented risks associated with those cells. Breast and colon cancer seem to be the two cancers most likely to be affected by weight. So, seriously now, vegetables, fruits and more vegetables. Lots of water. Limited alcohol. Very limited red meat and sugar. This is for everybody, not just those of us who need to lose some of that fat tissue. And what better time of year to eat lots of produce? Maybe you can gather it right in your own yard or maybe you have to drive a couple of miles to a farmstand. However you get it, get it. And eat it. I found this recipe on Facebook last week. 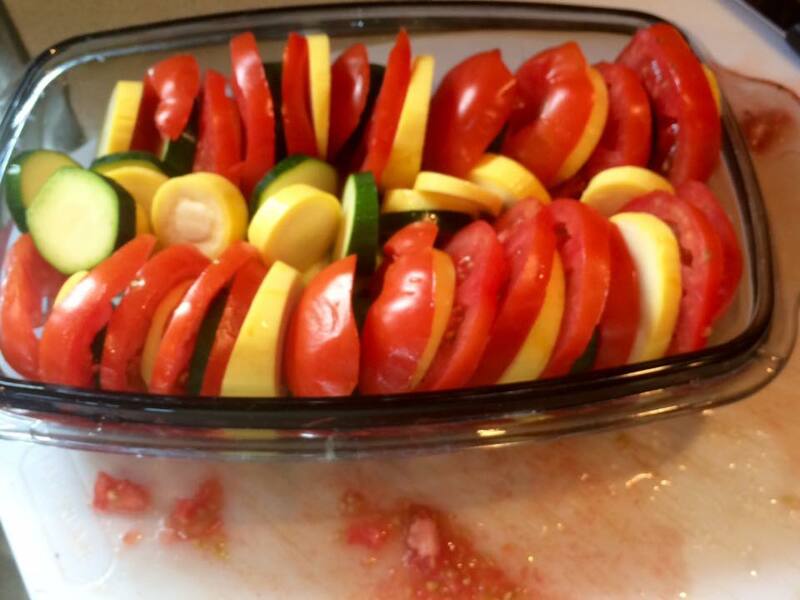 Since we’re drowning in tomatoes and zucchini, it’s very handy. And very easy. So easy I’m not even going to give you exact measurements. Other than to say bake this at 375° for about 30 minutes or until squash collapses and cheese melts. All dressed up and ready to pop in the oven. 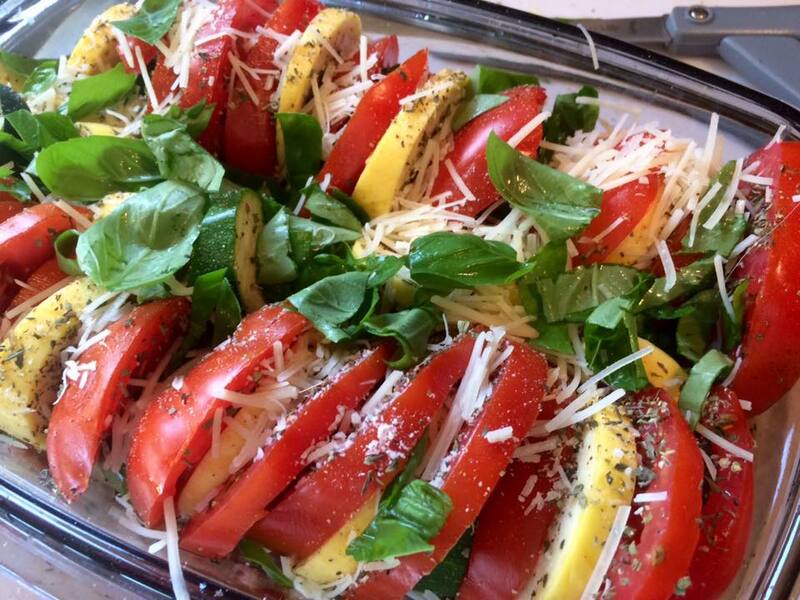 Alternate squash and tomato slices in a glass or metal baking dish (size depends on how many vegetables you’re using). Drizzle with good-quality olive oil. Sprinkle with salt and pepper, onion powder and garlic powder to taste. Top with as much or as little cheese as you like — a Mexican shredded mix and Parmesan make a good combo. You’ll notice in the photo at right that I also tucked in lots of fresh basil leaves. We like our baked vegetables to have a light char on them. 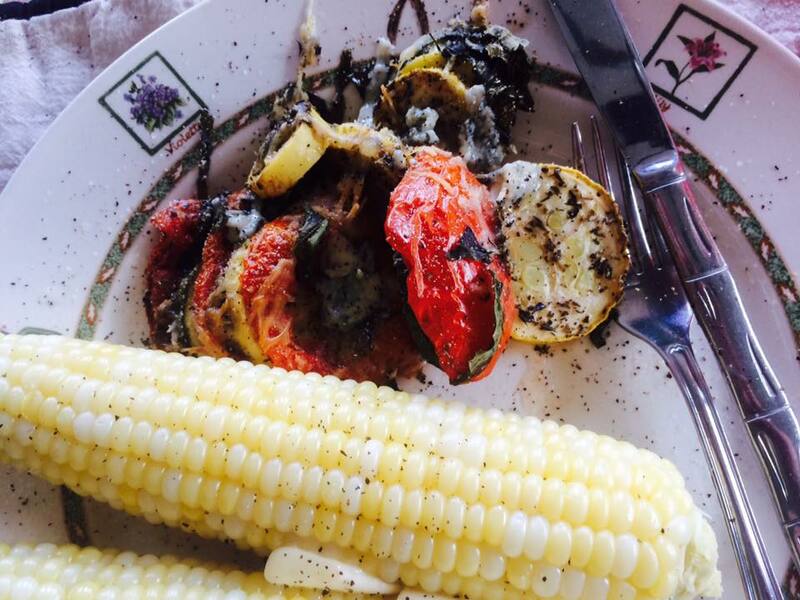 Fresh sweet corn and a local cantaloupe complete this summer supper.